Within each menu option, you will see a list of items (for example, reports) which you can select from. Once you have selected a menu item (for example, a report), it is shown in the center of the page. You can expand the content area by clicking on XLReporting in the left-top: this will minimize the menu area and maximize the report area. Clicking again will restore it to the way it was. 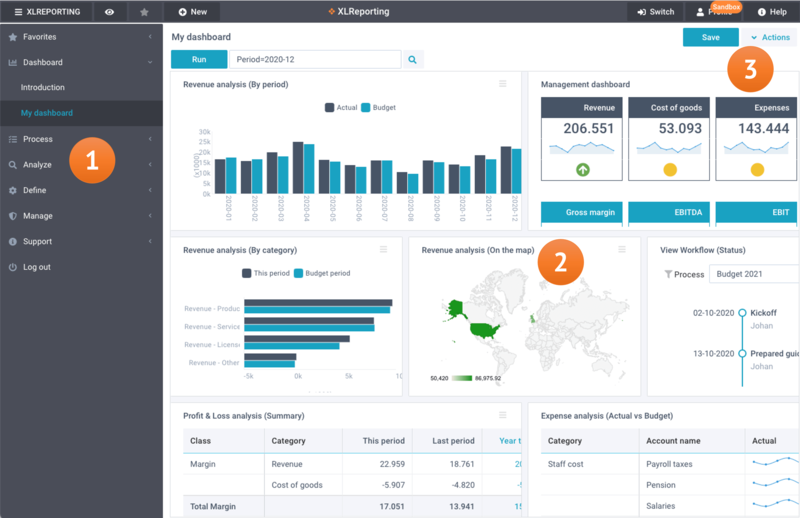 XLReporting has common features across all pages, tables, and reports. Getting to know these features early on will save you time along the way. Take a tour - start a guided tour that takes you through the important fields on the current screen. Help - open the relevant article in our Support Center. Save - save the changes you have just made. Actions - this opens a dropdown menu with options that are available at any given time, such as deleting an item, creating a new item, download to Excel etc. The top of every window shows a small ❶ symbol next to the title, which shows useful instructions when you hover over it. Also, most fields have tooltips which show when you hover over the field.